The device André is using is called the Space Linear Acceleration Measurement Device, or SLAMMD (pronounced “slam-dee”) for short. 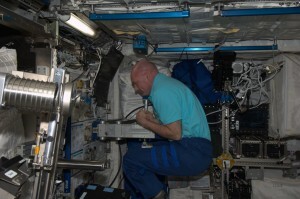 Why is measuring body mass needed in space? What exactly is SLAMMD and how does it work? 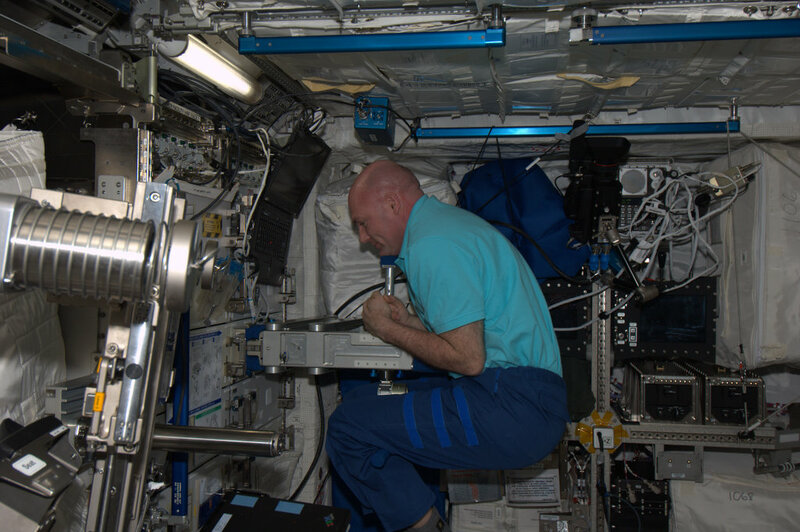 One of the side effects of a long stay in space is the loss of bone density and muscle mass because astonauts don’t have to work against gravity like we do here on Earth. Over time, if no countermeasures are taken, the loss of bone and muscle mass means that the astronauts will experience problems on their return to Earth’s gravity. To go someway to counteract these effects, the International Space Station crewmembers are prescribed two hours of exercise every day. Research has also shown that there are dietary changes that can help with the bone loss. The exact mechanisms are still not known and scientists are still conducting this research in space today – André and his fellow Expedition 30 crewmate Dan Burbank have for example been following a strict diet for the past couple of weeks for ESA’s SOLO experiment. SOLO looks at reducing the amount of salt in their diet to see if this helps prevent bone loss. But how do you know if such interventions are having the desired effect? One measurement to check the physical condition of the astronauts is to weight them, but in space you can’t simply stand on the weighing scales like we do on Earth. That’s where SLAMMD comes in. Using SLAMMD astronauts can accurately measure body mass with the help of Newton’s Second Law of Motion, F=ma (force is equal to mass times acceleration). Firstly the astronaut has to wrap their legs and body around the device (as seen in André’s photo). SLAMMD contains two springs which generate a known force (F) against the mass (m) of the astronaut. Optical sensors measure the acceleration (a) of the movement. Puttings these value for force and acceleration into the equation, SLAMMD outputs the astonaut’s mass. Did he say that the hammer would reach the ground before the pen on earth?